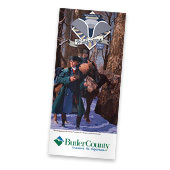 Brochures and Guides | Visit Butler County Pennsylvania! 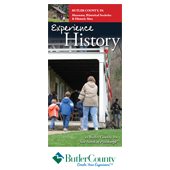 Explore More in Butler County, Pennsylvania. From charming towns and exquisite parks to bustling regions and rolling farmlands... you'll certainly find variety here, and a few quirky attractions along the way. Discover the "hidden gems" throughout the county like Moraine State Park and our quaint towns filled with local shops, restaurants and museums. Sometimes the best treasures are found off the beaten path. 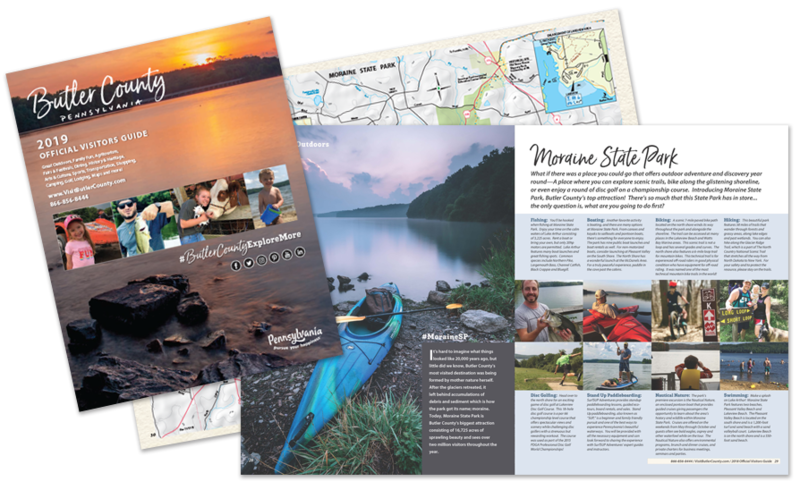 Uncover all that Butler County has to offer in our 2019 Official Visitors Guide. 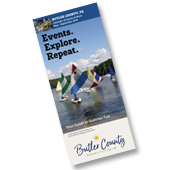 You might already be familiar with the Big Butler Fair and the Regatta at Lake Arthur, but Butler County has events all year long! 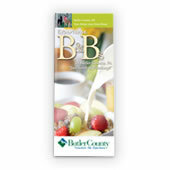 Be sure to keep this brochure with you so you never miss a beat. This helpful brochure features contact information, as well as descriptions, dates and locations for all that’s happening. Printed twice each year. You know the feeling you get after tasting a cold, draft beer? Now imagine being able to try a variety of craft beers made locally! Introducing the Butler County Beer Circuit - a listing of the local breweries within the area. Here you will find the Brew Pubs (and a distillery) that create the beverages we know and love along with highlights and special features throughout the year. You’re in Butler County, PA - home to rolling hills, charming towns, quirky attractions and breweries! Go on a journey across Butler County’s scenic farmland to view some of our most intriguing barns. 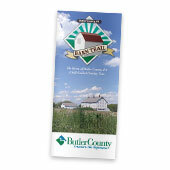 By following the barn trail, you’ll learn more about agriculture and discover some interesting history. This brochure is great to have on a day when you want to roll the windows down and enjoy the little things. You’ll be surprised at what beauty can be found throughout our farmland! - View the Barn Trail here. Our newest addition to the brochure list is our Washington’s Trail brochure. Featuring George Washington’s momentous journey in the fall of 1753, just prior to the French & Indian War, the brochure gives visitors the route he followed and the history of his trip. Learn about his hardships, perils and the incident that could have changed the course of our nation’s history. We've really beefed up this brochure! It now includes a new and improved map (the previous map, combined with a historical one), a timeline, interesting and educational facts, and even a recipe for pemmican (which would have been eaten at the time). If you’re a history buff, interested in the French & Indian War, or looking for something new and different to do, experience Washington’s Trail! Take a trip through Butler County and visit the sites, shops and eateries along the way. 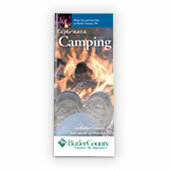 For all of you that love the great outdoors, the many wonderful private campgrounds in Butler County and surrounding areas can provide you with a place to fit your camping style. From basic tent camping and cooking over the fire to the full hookup RV trailer and motor home sites, you’ll find just what you’re looking for. 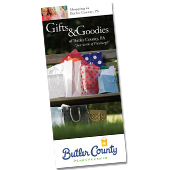 If you are looking for a variety of shopping fun, Butler County is the place to be! From the traditional mall setting, to our specialty shops offering gift items, clothing, toys, and even alpaca products, you are sure to find something to suit your needs and your thirst for adventure. Come experience Butler County’s beautiful and tranquil Bed & Breakfasts. Found in every corner of the county, the area’s Bed & Breakfasts are listed in this brochure along with an overview of what they have to offer visitors. Contact and reservation information as well as photographs with descriptions of the surrounding landscape are also included. Sit back, relax, and stay awhile. Experience golfing in Butler County with one of the ten courses that we’re sure will fit you to the tee! 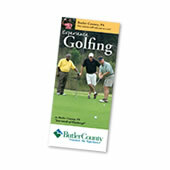 Whether you're an expert or a first-timer, you'll find a Butler County golf course with a suitable skill level. Our courses are all within a 30-minute drive of one another and have unique panoramic landscapes and rolling hills to make your game even more enjoyable. Bacon? Cupcakes? A big, juicy steak? A colorful salad? Regardless of what tickles your fancy, you can probably find it in Butler County. 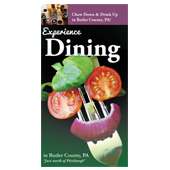 Delectable dining options can be found in every corner of the county, from Cranberry Township to Slippery Rock. To enhance your eating experience, many restaurants host special entertainment, so be sure to check out their schedules ahead of time! You don’t have to visit a big city to hear a great symphony, witness spectacular works of art or see a well-done performance. Butler County, Pennsylvania has an impressive representation of arts from music to theatre to visual arts. Have you ever experienced glass blowing? That’s a rare art form that you can witness and even try here, too! 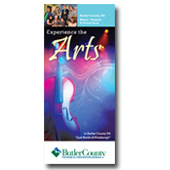 So get ready to “ooh” and “ahh” and tap your toes during a fantastic arts experience in Butler County. Our theatre groups are breaking their legs for you. Our small towns are packed with some big history! Did you know that the first U.S. President, George Washington, set foot here? Or that Butler is the birthplace of the “jeep?” Learn about these and much more through our museums and historic sites. Brochures are also available in these conveniently-located racks around the county. Click here for a map of these locations.